Beginning this Friday afternoon from 2:40-3:10, our students will be participating in Sharpen Our Saw time or S.O.S. 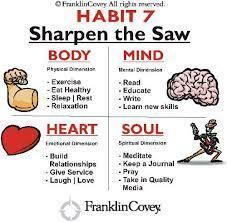 Sharpen the Saw is the 7th Habit of the Leader in Me. Sharpen the Saw means that we are taking the time throughout the week to do things that strengthen our mind, heart body and/or soul. As a teaching staff and after talking with students last school year we decided that implementing a scheduled time for staff and students to do this during the week was important to everyone. All of our teachers have chosen something that is fun and fulfilling for them so they can share it with our students. Students were then given a menu of choices and chose their top three choices of activities that they’d like to participate in during this time. Multi-age groups have been made and students will be able to choose new activities every six weeks. Some of the activities that students will be participating in include: puzzles, blocks, dance, music, crafts, farming, kickball, doodling, gardening, nails, sign language, walking, board games, legos, cursive writing, stress relief and dog training. We look forward to posting pictures of your students engaged in these SOS activities. Ask them throughout the week how they will be sharpening their saw on Friday afternoon.